While steel is well known as a gearing material, for both its strengths and its weaknesses, ductile iron remains a lesser-known commodity even after several decades of use. Gears made for applications in the mining and cement industries cover a wide range in terms of size and transmitted power: from Ø1 m to Ø14m, from 500 kW to 17 000 kW (dual pinion drive). To select a material to suit all these different applications is somewhat more complicated today than perhaps 50 years ago, when cast steel was the only choice available. To select a material to suit all these different applications is more complicated today than perhaps 50 years ago, when cast steel was the only choice available. 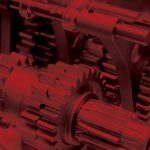 With a multitude of alternate gear materials (such as cast steel, ductile iron, fabricated steel, and austempered ductile iron [ADI]) comes a more complex choice for the user: “Do all materials have the same strength? How long will my gear last? How fast can I get this gear? How much will it cost?” These are some of the questions raised every time a choice is to be made. While steel is well known as a gearing material, for both its strengths and its weaknesses, ductile iron remains a lesser-known commodity even after several decades of use. 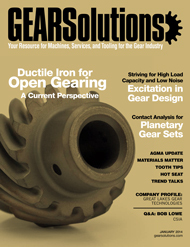 The goal of this article is to present the current “state-of-the-art” with respect to ductile iron as a gear material, including its mechanical properties as applicable to gear design, structural characteristics, typical manufacturing and inspection plans, and in-service behavior. For each of these aspects, ductile iron will be compared to other available materials for open gearing design and manufacture, such as cast steel, forged/fabricated steel, and austempered ductile iron. While steel has been known for ages, and has been extensively used in all types of machinery and components, ductile iron was “accidentally” discovered only 60 years ago. It has since experienced an exponentially growing market, and has undergone all kind of testing to be better defined and understood. 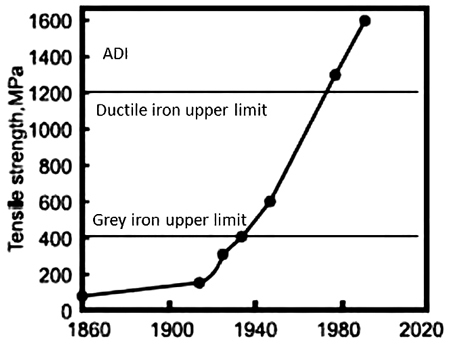 Figure 1 provides an overview of the mechanical property development of cast irons through the years—tensile strength has exponentially increased with the improvements made in grey, ductile, and ADI. One of the most important achievements over the years has been in the understanding of the chemical composition influence. 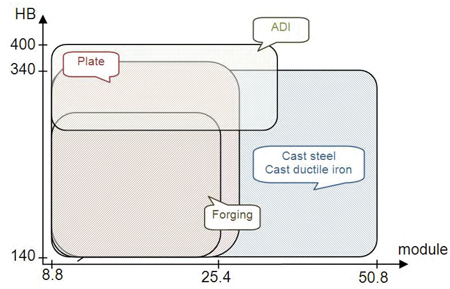 Figure 2 illustrates the difference in chemistry between steel and ductile iron. Steel has a low carbon content (between 0.15 and 0.45% for gears), while ductile iron contains approximately 3.4% carbon. Ductile iron also contains about 2% silicon (needed to obtain graphite rather than carbides, pushing the “carbon equivalent” to 4.3% as shown on Figure 2) and magnesium (to get nodular graphite instead of flake graphite as in a grey iron). The first consequence of the low carbon content in steel is an extended solidification interval—solidification starts at a given temperature and ends 70-100°C lower. Because of this difference between the beginning and the end of solidification, steel has a liquid-to-solid volume difference (or “shrink”) of about 2%, which explains the necessity of using risers in steel castings to avoid porosities. Risers are reservoirs that continue to feed the part with liquid metal during the solidification phase in an attempt to reduce the presence of shrink defects in the last area of solidification. The need to use risers necessarily means that the yield (the ratio of finished part weight to liquid metal consumed) is significantly reduced for steel castings. With ductile iron, chemistry is made to meet with the “eutectic point”—at that point (where all the lines merge on Figure 2), theory states that ductile iron is immediately transformed from a liquid to a solid. There is, therefore, no solidification interval. In practice this is not exactly the case, but a very narrow solidification interval, combined with graphite expansion, results in a liquid-to-solid volume difference of only 0.1% for ductile iron. As such, there is no need to employ risers in ductile iron castings, the resultant yield being significantly higher than that of cast steel. Another consequence of the narrow solidification interval is that ductile iron can have a complex casting geometry that is sounder than steel. 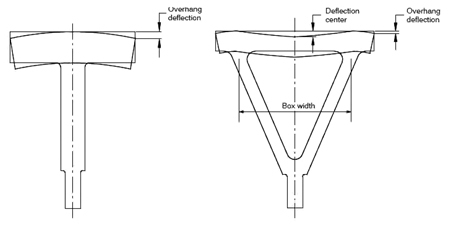 As an illustrative example, the thickness differences between gussets, the web, and the outer rim of a steel gear casting will often produce cracks in the connecting areas. The outer rim can easily be 180 mm thick, while the gusset is typically only 50 mm. The gusset solidifies first and contracts, while the outer rim is still hot and expanded; something has to give, and a crack is initiated. With ductile iron, because every part of the casting solidifies at the same time with a low shrink ratio, these connections are sound. Another example is the size of a radius on the same part made in ductile iron and in steel: a connecting radius of R80 is standard for steel, while it could be reduced to R50 in ductile iron. This is in relation to the castability of a material, i.e. the ability to fill every little part of the mold with sound metal. In addition to its effect on the solidification, carbon content has also a major influence on the structure of the material, as shown in Figure 3 (all pictures show a matrix composed of ferrite [white; 0.02%C] and pearlite [brown; 0.8%C]). In steel, carbon is integrated into the matrix in the form of carbides, with pearlite and cementite being the most common types. In a ductile iron, carbon is predominately present in the form of nodular graphite. In grey iron, carbon is present as graphite flakes. The presence of graphite explains why ductile iron has lower mechanical properties than steel and why, until recently, it was difficult to achieve a high hardness (over 300 BHN) with this material. The presence of graphite in different forms implies that steel and ductile iron castings having the same hardness will not have the same matrix, and this will have a major influence on the behavior in service as will be demonstrated later in this paper. As applicable to cast steel, a given chemistry for ductile iron can have different structures, meaning different properties, depending on the manner it is cooled or heat treated. The photos in Figure 4 show the same ductile iron part (same chemistry) but cooled down, or heat treated, in different ways. 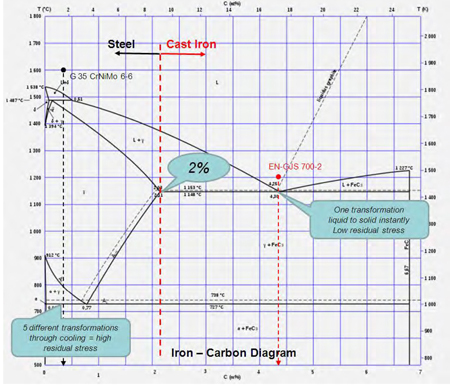 Keeping this information in mind and referring again to the iron-carbon diagram in Figure 2, one can see that a steel casting will cross a lot of different lines while decreasing in temperature: each line is a transformation of the matrix, each inducing its own stresses, increased by a high cooling rate. The accumulation of internal residual stresses through the transformations can eventually lead to cracks. During cooling, ductile iron also crosses transformation lines, but to a much lesser extent than steel. As such, residual stresses in ductile iron are much lower than those; in cast steel. This underscores why steel has to go through complicated heat treatment cycles (i.e., normalization at 950°C, followed by single- or double-tempering at 560-600°C, then stress relief after repair at 540-580°C), while a cast ductile iron usually undergoes only a simple stress relief at 560-600°C. In the case of austempered ductile iron (ADI), the heat treatment process is much more complex. In Figure 4, the right hand picture shows a typical structure of ADI. 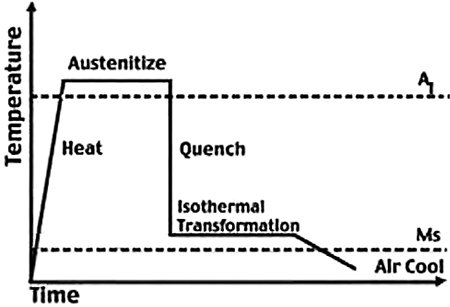 In the ADI process, parts are first poured and then undergo a specific heat treatment to obtain the required matrix, as shown in Figure 5 and Figure 6: austenitization above A1 (750-800°C), quick cooling through a quench, stop and hold at a temperature around 300-350°C for “ausferriting” (holding times depend upon the thickness of the material). At this relatively low temperature, the matrix transforms from austenite to ausferrite (mix of acicular ferrite and high carbon stable austenite). This structure is specific to ductile iron and represents an intermediate structure between bainite and martensite in terms of hardness, with a substantial improvement in impact resistance. Today, ductile iron is no longer a “new” material. Its elaboration process is well known, at least to the same extent as steel. Nevertheless, ductile iron is not an easy-to-achieve product: it requires stringent process control, practical experience and a thorough understanding of the metallurgical processes involved to get a sound part from the first attempt. Mechanical properties for ferrous materials are well documented—from static to dynamic, all kinds of properties have been tested. Table 1 summarizes some of these properties for different gear materials and at a given hardness of 300 BHN. The first set of figures introduces the most commonly used properties in defining a material. Unfortunately, yield strength, tensile strength, elongation and impact resistance are determined through a uni-axial and single load, while a gear is undergoing multi-axial and repeated loads. 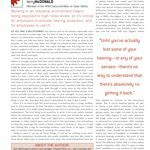 A concept of endurance would seem to be more applicable in the case of gearing. What is of interest, however, is the tensile strength. There is a direct relationship between tensile strength and hardness, and hardness is key in evaluating most of the design variables. Today, ductile iron and cast steel materials offer the same level of hardness: 340 BHN minimum, regardless of gear size and tooth module. With such a high hardness, combined with a large module and face width, open gear sets are now reaching power levels well above what was considered a concept only a few years ago. 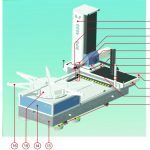 Dual pinion gear drives to transmit a combined 17 000 kW of power have been recently delivered to mine sites; designs for 20,000 kW drives are under consideration and a practical reality. But beyond just the hardness value itself, the question of its homogeneity through the gear rim must be explored. 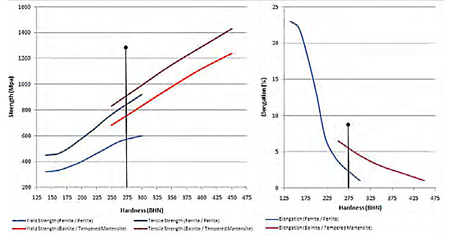 Figure 7 (steel) and Figure 8 (ductile iron) present the variation of hardness through the gear rim thickness, and more specifically the expected reduction at the tooth root for different modules. It is now generally accepted that a loss of 5 BHN per inch of depth occurs in steel, which compares to a 1 BHN loss in hardness per inch of depth in ductile iron. This information becomes critical when considering large modules, where a difference in hardness between the tip and root of a tooth can reach 15 BHN for a module of 36. This difference comes from the fact that hardness for a cast steel is primarily obtained through heat treatment, whereas for a ductile iron hardness is more related to chemistry. Moreover, ductile iron structure through the rim is more homogenous than steel because of the way it solidifies. One can argue that this loss of hardness through depth in steel can be overcome by adding alloying elements to increase the quenchability of the material. While true, the difference is not that significant, and what may be gained in quenchability would be lost in weldability. The first set of values in Table 1 also provides some minimum guaranteed values for impact resistance. The low impact resistance of ductile iron is often questioned, but this property is of limited interest for gear applications. Indeed, this property is of interest in the case of severe shock loads, but gears should run smoothly without experiencing such conditions in service. Vibrations can always occur during operation, and ductile iron is far better at damping these than steel (see Figure 9). This allows for the attenuation of dynamic loads in service, although this ductile iron specificity is not considered in the calculations of ANSI/AGMA 6014-A06. The second set of values in Table 1 is also of interest, especially when some calculations and finite element analysis have to be done. Once again, the figures are in favor of steel, but ductile iron is not that far behind and possesses an interesting lower density that allows for some weight savings on equivalent part designs (-8%). A discussion of the Young’s Modulus is also in order. Young’s modulus (and its relative, yield strength) represents the capacity of a material to absorb a given load without permanent deformation. On the one hand, it can be argued that a lower Young’s Modulus implies a lower load limit until permanent deformation occurs; but, in the case of gears, thankfully, applied stress is well below the yield strength. On the other hand, a lower Young’s Modulus can be interpreted as less stiffness or, in other words, some pliancy. This could be seen as an advantage to better absorb stresses, especially during start-ups. The third set of values in Table 1 is directly related to specific fatigue limits for gears. Figure 10 and Figure 11 depict AGMA 6014 curves for allowable bending, Sat, and contact stress, Sac, of the 4 materials under consideration (of note is that no difference in Sat and Sac is considered between cast steel and wrought steel). 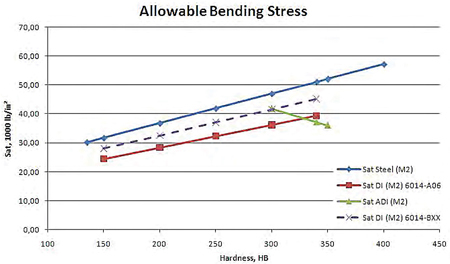 The lower allowable bending/contact (pitting) stresses for ductile iron in comparison to steel are usually compensated for through a combination of modifications in the number of teeth, hardness, face width and/or module to reach the required safety factors for a given power to be transmitted. 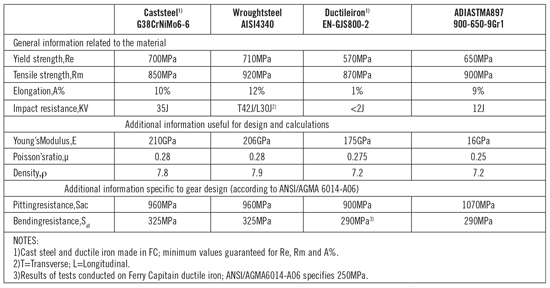 Regarding bending strength, ANSI/AGMA 6014-A06 specifies ductile iron as being about 25% lower than steel (Figure 10). 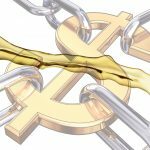 Recent studies have demonstrated that these values for ductile iron are significantly understated, and that they can be increased by at least 15%. This increase is a direct gain on the transmissible power for a given design. 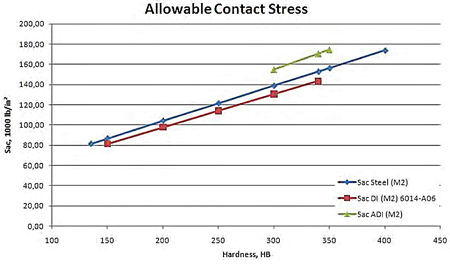 In terms of allowable contact stress (Figure 11), ductile iron is only 5% below steel in the ANSI/AGMA 6014-A06 specification limits. 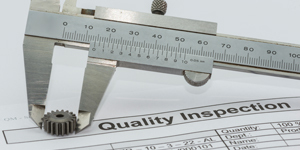 Based on recent tests and reviews, it is also possible that ductile iron is being underestimated in this performance aspect within the ratings specification. Investigations are ongoing to assess whether pitting resistance may in fact be better for ductile iron than steel due to the presence of graphite. 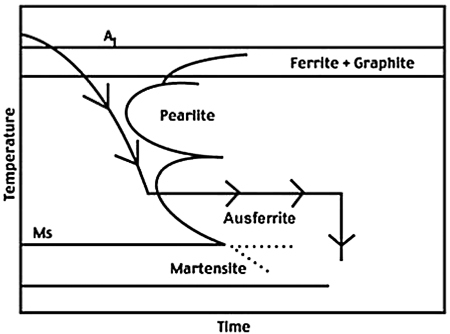 Reasons of these improvements can be seen as follows: In ductile iron, a crack that may develop in the matrix (whether originated by pitting or root failure) will be intercepted by graphite nodules along its path (see Figure 12). The crack is then arrested by the nodule, similar to what a drilled hole would do. 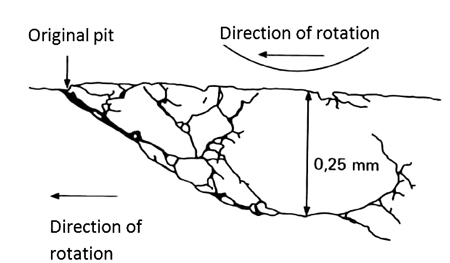 Then, the energy needed for a crack to continue to propagate (or to develop in another direction) needs to be at a higher level than for steel, where a crack meets no resistance through the matrix (see Figure 13). 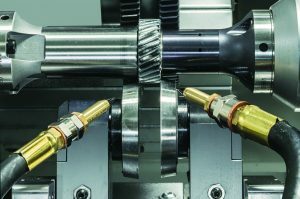 In considering the influence of the microstructure on mechanical properties, it should be noted that matrix influence or homogeneity through the gear rim are not accounted for in establishing allowable bending and contact stresses for gear rating calculations. Cast steel has been predominant in the gear world for decades, and all materials are tested and compared to it. It would be ideal if all materials could be characterized and tested in an identical manner, but steel and ductile iron, or cast and wrought products, have different behaviors. Figure 14 shows that different structures are possible for the same given hardness (i.e., 275 BHN)—either pearlite or bainite. 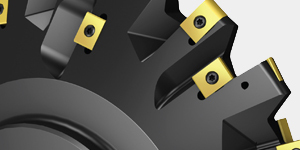 Their mechanical properties and characteristics are not the same—pearlite provides lower yield/tensile strengths and elongation, but an excellent machinability; bainite, at the same hardness, provides higher yield/tensile strengths and elongation, as well as an excellent resistance to abrasion. 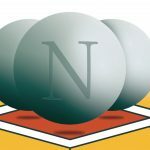 The size of the graphite nodules and their distribution also has an impact on mechanical properties, as has been well documented . Gaining a deeper understanding of these characteristics will assist the gear designer in selecting the best material for the application. Ongoing testing of ductile iron materials should serve to advance this understanding, and perhaps one day be reflected in the gear ratings standards themselves. Table 2 summarizes the manufacturing process steps for a gear made for a given application but from different materials. Of course, there may be differences in specific gear design parameters for the selected material. Before doing any machining, a sound gear blank is needed. Whether ductile iron, cast steel or ADI, a pattern must first be made to produce the gear castings. The need for a casting pattern is often viewed as a mandatory loss of productive time, typically taking 2 to 6 weeks, depending on the gear size and pattern type, and may represent up to 10% of the part total cost. In comparison, fabricated gears do not have this constraint. Manufacturing can start quickly with the welding assembly, provided that steel plate materials are available. However, alternatives to traditional pattern-making methods are now available to reduce both the pattern cost and the pattern-making lead-time. With the “rapid prototyping” process (CNC machining of blocks of polystyrene foam based on 3-D part models), patterns can be ready for molding within a week (or 10 days for the largest of parts). Another recent development for large castings is the machining of sand blocks directly to the net casting shape. A separate pattern is not needed, with the casting mold being directly assembled from the CNC-machined sand blocks. The general foundry process is the same for all cast materials, except that it is much faster for ductile iron. This is related to the specificities of ductile iron: no need for risers, and no up grading (heat treatment and welding repairs). Heat treatments are not required with ductile iron as a general rule. In most cases, in-mold stress relief is sufficient to obtain a stable structure. 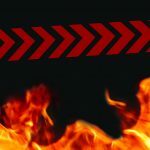 Occasionally, a stress relief cycle in a heat treatment furnace may be done, this being mainly dependent on the casting size and targeted hardness. However, ductile iron has very poor weldability in comparison to steel. It is not that it cannot be welded—it is just difficult. Some welding processes (homogenous as well as heterogeneous) have been developed through the years, but the welding of ductile iron is not a practical solution to fix base casting problems as can be done for cast steel. As cast steel always has some minor cracks, inclusions, hot tears, etc., in the radii that need to be fixed before machining, welding repairs are a “standard” operation that the steel manufacturers must perform. Being able to repair a steel casting is a real advantage over ductile iron, where a problem generally leads to a scrap. As such, it is imperative that the ductile iron foundry obtains a sound casting from the first attempt – it is good or scrap, there nothing in between. ADI blanks follow the same principles, as they are made from ductile iron castings. The difference resides in the heat treatment following the foundry process as explained earlier (see Figure 5 and Figure 6). This heat treatment is the limiting factor in terms of the size of the gear parts made from ADI. With castings, or fabricated parts, the limits in terms of size are typically defined by handling/transportation considerations; with ADI, part size is limited by the size of available heat treatment furnaces (currently around 2 m long) specific to this process. As a result of this size limitation, an ADI gear will be composed of more segments than the equivalent ductile ironcast steelfabricated gear. This multiplication of segments, and thus joints, increases the risk of transmission errors (bigger pitch deviation at joints, alignment problem, knocking, etc.). Manufacturing of fabricated gear blanks has nothing in common with castings. One problem with fabricated gears is the availability of outer rim material with a high hardness. This type of gear is made of two materials, i.e., AISI 4340 for the outer rim, ASTM A36 for the web and stiffeners. 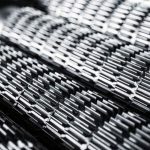 While the A36 steel is readily available as a “stock” general-purpose material, the outer rim material must often be custom-ordered (with varying lead-times). The rim is made to the required hardness, and forged or rolled to the gear diameter. • Castings are made of one material, from the inner flange to the teeth. It is obvious that power transmission from the gear mesh to the mill/kiln is also made through the web and the stiffeners. But looking at ANSI/AGMA 6014-A06 standard, the influence of having two different materials for the teeth and the web is not taken into account in any rating. Castings have the same properties in the teeth area and in the web/inner flange, while a fabricated gear has different properties in these areas (without considering the full penetration welds and their influence). It would be of interest to evaluate the influence of gear construction beyond the outer rim (i.e., teeth) upon the service life of a gear, as this is little known at present. • Castings are isotropic; their mechanical properties are the same in all directions. Wrought products are anisotropic materials; their mechanical properties in the direction of forming are not the same as in a direction perpendicular to it. Apart from finding suitable equipment to roll huge thick plates, the rolled outer rim raises the question of having different mechanical properties in the longitudinal and radial directions, as well as the difference between the outer diameter (in tension) against the inner diameter (in compression) when rolled. Further study of this point would also be of interest. 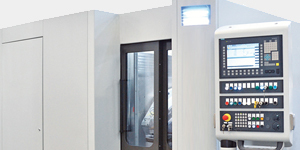 In terms of machining, once the gear blank is available, times are similar for all materials. For a given hardness, ductile iron is generally easier to machine (i.e., deeper cuts, faster turning speed, no cutting oil but dusty) than steel, but the main difference in terms of machining time is due to the fact there is less stock to machine. Lower deformation of the base castings at the early stages permits using smaller machining allowances for ductile iron. 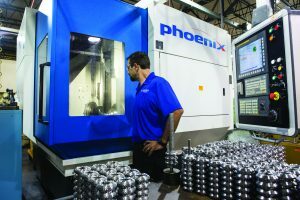 Dimensional stability is a key consideration for machining and cutting, as these processes induce stresses in the material. Ensuring that residual stresses are close to null is very important to avoid warping and structural changes (and the obvious reason behind all the heat treatments done at the gear blank stage). Steel, whether cast or wrought, inherently contains more residual stress than ductile iron (as a function of solidification, quenching, and welding). Relieving the internal stresses from solidification and quenching is usually done through normalization and tempering. Removal of stresses induced from the welding (repair or assembly) operations must be done at a lower temperature than the previous tempering, otherwise hardness may be decreased below the minimum required. As a result, the tempering temperature may not be high enough to fully remove residual stresses and/or transform an unstable structure created by welding (like martensite or residual austenite) into a more stable matrix. Dimensional stability can then be compromised during machining. In terms of soundness inspections, with all materials being ferrous alloys, they follow the same rules and can undergo the same non-destructive tests (NDT). 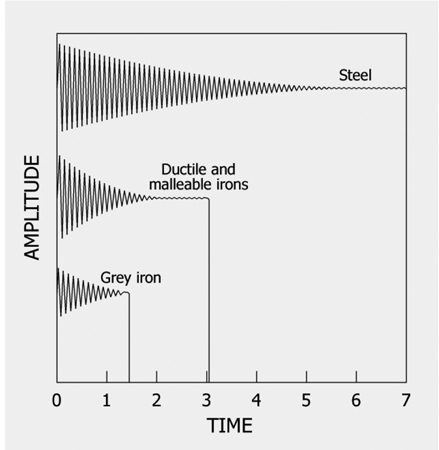 Ultrasonics (UT), magnetic particle (MPI), dye penetrant and Eddy current are all applicable to ductile iron and ADI with minimal differences when compared to steel. Table 3 summarizes non-destructive test methods (MPI/UT) and applicable acceptance criteria (per ANSI/AGMA 6014-A06) by material type. One main difference is with respect to UT. ASTM A609 limits the loss of back wall echo (LBWE) in steel to 75% for the definition of an indication. The same A609 standard created for steel is also used for ductile iron, but with the noted exception of considering a LBWE of 90%. This was proven in the late 1980s to give proper determination `of internal defects for ductile iron, and has been accepted ever since. Another difference can be seen with respect to MPI criteria, and the acceptable size of an indication. This difference should be eliminated in the future, as most OEM specifications make no distinction between ductile iron and steel for such indications (see Figure 21). 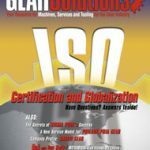 In terms of the other materials, it has been interesting to note the progression of ADI and fabricated gears in the marketplace, as these materials now represent viable alternative solutions in terms of delivery, price, and service for many applications. Nevertheless, due to limitations in terms of forged ring sizes/plate hardness for fabrications, and heat treatment furnaces limiting the segmentation for ADI, these materials are generally considered of more interest for smaller gears (up to Ø5-6m). 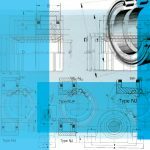 For larger sizes and high power transmission, castings continue to be considered the more economical and reliable solution. • module: the larger the module, the bigger the tooth size. • a deeper tooth, thus increasing hardness loss at the tooth root (see Figure 8 for steel). • a thicker gear rim, with ANSI/AGMA 6014-A06 recommending a minimum outer rim thickness of 4.5 x module for both steel and ductile iron gear materials (as required to minimize rim deflections as depicted in Figure 15). Table Obtaining large rim thicknesses with castings is not a problem. Gears having module 50.8 were manufactured some years ago in both cast steel and ductile iron (with a corresponding minimum rim thickness of 230 mm in the finish-machined condition). Of course, with cast steel, a large rim thickness increases the risk of internal defects at the tooth root, as described earlier. Such large modules are more difficult with fabricated gears. For example, a module of 28 corresponds to a minimum gear rim thickness of 130 mm (and probably 150 mm thick for the gear blank rim with machining stock allowances factored in), which starts to become problematic from both a plate supply and bending/rolling perspective (although still feasible). Figure 16 depicts the current state of power transmission capability of a given gear material as a function of hardness and module that can be employed. In simple terms, the larger the module and the higher the hardness, the more powerful the gear can be. A discussion of ductile iron would not been complete without introducing its most common defects, and to compare these with the other materials. Dross, stringers-type (Figure 17), is the most common discontinuity that can be found in ductile iron. 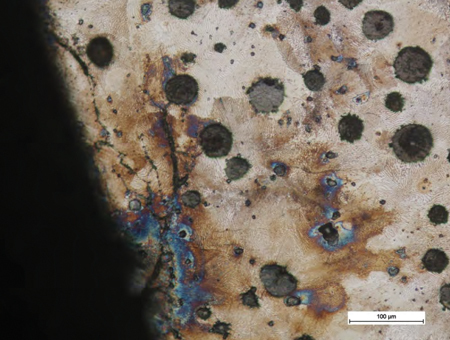 These stringers are non-metallic inclusions, composed of a mixture of silicon (needed to obtain graphite), magnesium (needed to obtain nodules) and oxygen (entrained into the liquid metal from the ambient atmosphere). Due to this composition, dross is specific to ductile iron. Stringers are linear indications, but they do not behave like cracks. Recent studies served to confirm that the bending strength of material containing a high concentration of stringers is still at least 60% of the original value of the unaffected base metal. This means that leaving these dross areas as-is in low stress= zones is far better than grinding them away and the resultant loss of strength through the reduction of thickness. Nevertheless, stringers in the teeth area should not be accepted. The second most common defect is porosity (Figure 18), essentially small holes created during solidification. Porosities in ductile iron can be called shrinkage, but are quite different from shrinkage in steel castings as they are sponge-like in structure and not a complete void. Their origins in ductile iron are the same as in steel: hot spots due to cross section configuration, problems with chemistry, areas of last solidification. Some studies have been conducted on the influence of porosities, finding that fatigue strength is reduced by about 50% in cast steel as compared to 25% in ductile iron. The remaining most common defect in ductile iron is graphite flotation (Figure 19). It is basically modified graphite, not detectable through UT or MPI, and it only appears as a color variation on the casting surface. The influence of graphite flotation on mechanical properties is small (about -6%). 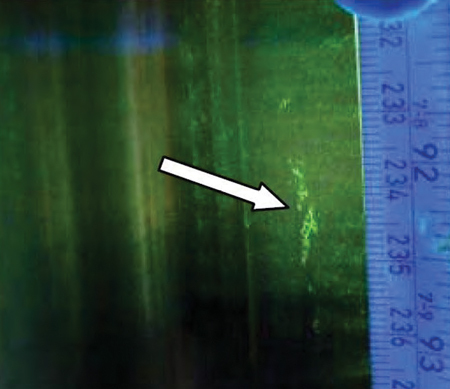 Once again, this type of defect is very specific to ductile iron due to the carbon content. In cast steel, the most common defect is cracking (Figure 20). Cracks can also occur in ductile iron, but they are not a primary defect type (and are strictly related to poor part design and casting). 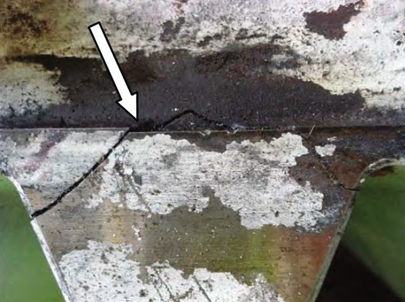 Cracks are inherent in cast steel (as previously explained in the paper). 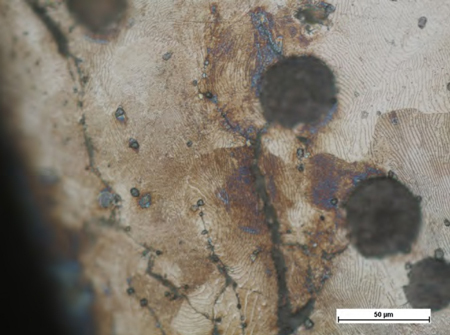 They occur during solidification between thick and thin sections of the casting (one area is solidifying while the other is already solid: something has to give). Cracks can also occur during the heat treatment process when the cooling rate is very different between thick and thin sections of the casting. Another indication specific to cast steel, and not encountered with ductile iron, is the presence of segregations (also known as secondary, or micro-shrinkages as depicted in Figure 21). These indications, usually between 3 to 30 mm for the longest, are areas of very fine shrinkage, appearing as linear indications under MPI. The segregations originate at the very end of solidification, where some micro-pockets of liquid metal are surrounded by solid material. As these pockets finally cool and solidify, their solid volume is reduced, thus creating the shrinkage. 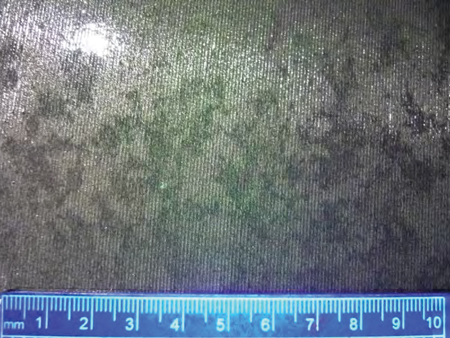 Most of the time, these indications are 3 to 5 mm deep, and a smooth grinding/blending is done to recess the defects from the surface to avoid opening under mesh. Defects in wrought steel are different, with de-lamination being the most common. It results in a non-cohesive material, thus explaining why minimum forging reduction ratios of 3:1 are required. For fabricated gears, compared to cast gears, the most common defects are of course welding-related: slag inclusions, poor bonding/fusion, high hardness gradients in heat-affected zones. 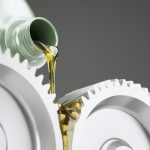 During the service life of a gear, many problems can occur: inadequate lubrication, overload, breakdowns, etc. Gears are designed to bear all these “upsets”, but sometimes they fail. Pitting is one mode of failure. It can be generated by a too high a contact pressure, a lack of lubrication, a misalignment, etc., but in all cases, it is a slow process. Pitting on steel has been exhaustively investigated, and the phenomenon, from the initiation to the final failure, is quite well understood. Laboratory tests, as well as practical case studies, have provided engineers with this knowledge. This is not the case with ductile iron. 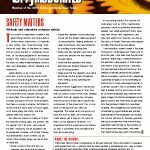 Laboratory tests are very limited, and there are no published reports of pitting on ductile iron gears in service. The photographs in Figure 22 show pitting on steel and ductile iron test wheels. The study that was done on the ductile iron test wheel shows that, in principle, the pitting process is identical to that for steel. The difference of course is in the details, and, to be clear, in the microscopic details. Figure 23 depicts the classical mechanism of pitting development, as it has been characterized for steel. 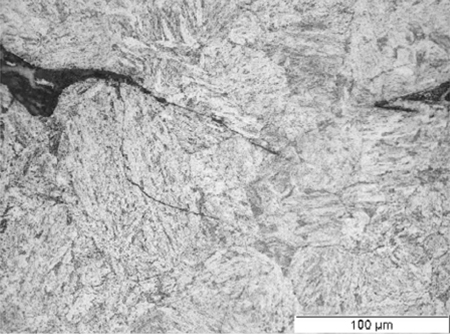 A similar network of sub-surface cracks is clearly visible on the ductile iron example in Figure 24. The main difference between the two materials is the presence of graphite nodules. • as “compressive absorbers”, attenuating the effect of contact pressure (graphite as a natural “embedded” lubricant may also have some influence here). • as “crack-stoppers”, considerably slowing down pitting development. Another effect of the presence of graphite nodules on the defect area is that the bits of metal that break free from the surface are smaller in ductile iron than in steel. As these bits of metal are removed, the pitted area becomes recessed to the surface and less sensitive to additional pitting development. The above may partly explain why no pitting on ductile iron has ever been reported, as wear and micropitting may be indistinguishable. Tooth breakage is another mode of failure, and is a faster process than pitting. Crack initiation is often traced to misalignment that results in full torque being transmitted on an essentially reduced face width. Combined with a localized anomaly (even when the anomaly is considered to be in conformance with quality requirements), a crack can initiate and propagate quite quickly. 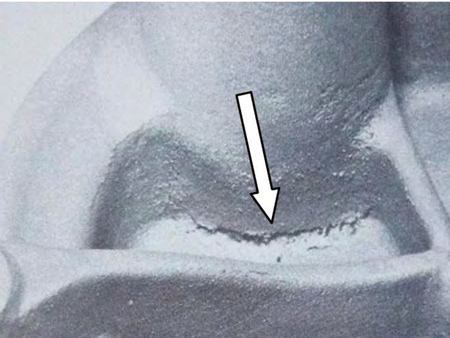 Although this is not a common problem, almost everyone involved in the mining or cement industry is familiar with an example of a tooth having cracked on a steel girth gear (Figure 25). This is not the case for ductile iron gears, as no published reports of such failures have been found. 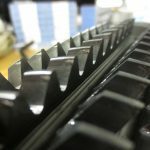 A very large installed base of steel gears in service could be one explanation as to why tooth breakage is widely known to occur in steel gears (albeit on a limited basis). 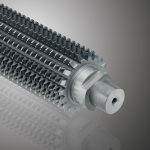 However, there are still hundreds of ductile iron gears in service as well; as such, one would expect to have some known examples of similar failures occurring in gears of this material. Another possible explanation could be the difference in terms of crack development and propagation in ductile iron and cast steel. 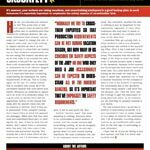 But this would still imply that a crack initiated in ductile iron, and should have been detected and reported at some point during a field inspection. Perhaps a more likely explanation for the lack of reported ductile iron gear failures is that the bending strength for this material has been significantly underestimated in design standards, resulting in very conservative (i.e., overdesigned) ductile iron gear designs. It is often argued that should a problem such as tooth breakage occur, ductile iron cannot be weld repaired, and this perceived lack of a weld repair option sometimes influences users to opt for steel gearing instead. Today, welding processes are available to repair ductile iron gears that are in service. Using specific Fe-Ni electrodes, the welding process requires no pre-heat, no post-heat/post-weld heat treatment, and results in no deformations (all advantages over comparable steel weld repair options). Trials have shown that bending strength can be maintained at close to 75% of the original value. Therefore, if for any reason a crack should initiate in a ductile iron tooth, a repair can allow users to still run their equipment, although at a reduced power, until such time that a replacement gear can be delivered. Over the past 30 years, hundreds of ductile iron gears have been made for open gear drives in the mining and cement industries. These gears have spanned the full range of size (Ø13 m) and transmitted power (7000 kW per mesh, and increasing). • Cast steel: All applications, all sizes, # 1 gear material by far, but more expensive and longer manufacturing time. • Fabricated steel: Fast delivery, reliable product, good population on smaller gears (< 6 m), very few above. 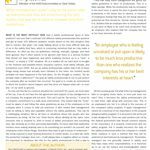 • ADI: High hardness and strength, but development is curbed by high segmentation required due to heat treatment limitations. • Lower elasticity. While true, elasticity is a parameter based on a single load acting in a single direction. 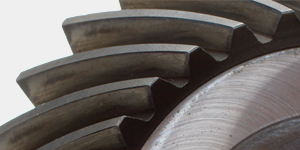 A gear tooth undergoes cyclic loads in multiple directions, so more needs to be considered. • Very low impact resistance. True, but gears are not meant to be subjected to impact loading. • Not weldable. No longer true, as weld repair solutions now exist for ductile iron gears in service. • Longer lead times than fabricated gears due to need for casting pattern. Advances in manufacturing techniques have reduced lead times for pattern-making to approximate those of stock plate procurement. Ductile iron may not be the highest rated material for all of these parameters taken individually, but its overall combination of the above properties makes it easy to understand why ductile iron is a reliable solution for open gears, large or small. 13. Uherek, F.C., Gear Material Selection and Construction for Large Gears, 12FTM13. * Printed with permission of the copyright holder, the American Gear Manufacturers Association, 1001 N. Fairfax Street, Suite 500, Alexandria, Virginia 22314. Statements presented in this paper are those of the authors and may not represent the position or opinion of the AMERICAN GEAR MANUFACTURERS ASSOCIATION. has worked for Ferry Capitain, Groupe CIF, France for the past 16 years, first as quality manager and, for the past nine years, as project manager specialized in mining products. This work deals with all technical issues on the metallurgic side as well as on the mechanical side of the manufacturing of large, as well as high-accuracy components for the mining industry. Since 2010, he has also been a member of AGMA Committee 7E, working on the upcoming revision of 6014 standard dedicated to open gearing. (co-author) is a graduate of the Ecole Supérieure de l’Energie et des Matériaux d’Orléans (France) where he has studied gears. 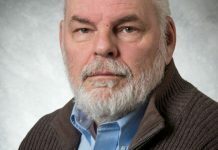 He started in 1990 in the automotive industry, where he worked on automatic gearboxes for heavy vehicles and special differentials based on planetary gears. He joined CETIM in 1991. 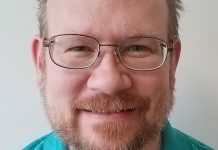 He has worked until 2002 in the Gear Department where he was an expert on gear unit failures and he worked with mechanical industries in the design of mechanical power transmissions. 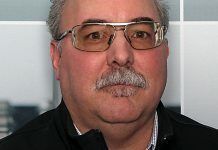 He joined CMD Engrenages et Réducteurs in 2002 where he is, since that date, Technical Support Manager. 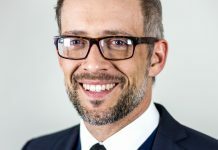 He is former member of the French delegation for ISO TC 60 (gears) in Working Group 2 (accuracy), working group 6 (gear rating), working group 10 (enclosed gear units) and 13 (bevel gears) and now member of AGMA committee 7e (6014).